A plant prison that is. This little Lemon tree came from a place down in Kendall. It was in a pot there, and now it is in a pot here. After seeing what they did in Capri and the Mediterranean with these trees and how they thrive in pots, we decided to try that here. Oddly enough it worked. The plant is on a drip feed irrigation and gets watered daily, and legally since it is a drip feed. It seems to be very happy there. 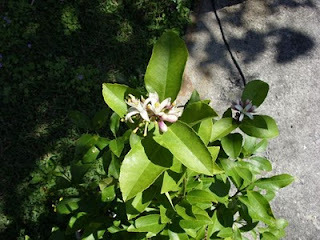 I've only had it a month and there are just clusters of fragrant Citrus blossoms all over the place. I really didn't expect that little tree to grow so happily that it would put out dozens of blossoms, and there are actually some teeny lemons trying to take hold. Note Taking in the Office On a Zaurus? The Roof is Evil, and Must Die! Coffee Roasting - the Reveal! I'll clean up the Flour Explosion later, OK? What do you need to roast coffee at home?